I posted about this back in August but the 90,000 mile offer on the on Virgin Atlantic MasterCard has returned. This time the offer expires on December 19th. I’ll copy the key points of the offer below but please see this post from when I posted about the offer last time for my analysis of this offer. 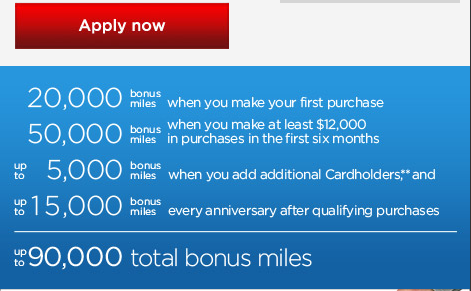 Even though its advertised as a 90,000 mile offer, I think its better to view it as a 82,500 mile offer as it seems likely you can spend $15k on the card if you already spent $12k of that getting the bonus 50,000 miles. Additionally, you earn 1.5 miles per dollar spent on this card so this if you do manage to spend $15k on this card, you will end up a total of 105,000 Virgin Atlantic Miles. The annual fee of $90 is NOT waived for the first year. This offer expires on December 19th. I got this card last time the offer was around so I am passing this time. Are you getting this card?